The Squarcialupi Codex (Florence, Biblioteca Medicea Laurenziana, Med. Pal. 87) is a compendium of pieces of music. It was published in Florence in the Trecento, the fourtheenth-century or the dawn of Italian Renaissance. Surprisingly, it contains 216 pieces of music. I have extracted the following information from Wikipedia, not a frivolous source. On the contrary! Included in the Codex‘s 216 pieces are 146 pieces by Francesco Landini, 37 by Bartolino da Padova, 36 by Niccolò da Perugia, 29 by Andrea da Firenze, 28 by Jacopo da Bologna, 17 by Lorenzo da Firenze, 16 by Gherardello da Firenze, 15 by Donato da Cascia, 12 pieces by Giovanni da Cascia, 6 by Vincenzo da Rimini. There are sixteen blank parchment folios which may have contained pieces by Paolo da Firenze and Giovanni Mazzuoli. The Codex is organized according to composers and includes a richly illuminated, in blue, gold, purple and red, portrait of each composer. 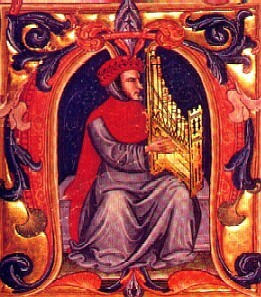 The illustration I have placed above our text is from Squarcialupi Codex, shows Francesco Landini, the most prolific among composers whose pieces constitute the Florentine Codex. The Squarcialupi Codex is also a testimonial to fraternity, the raison d’être of schools. The Squarcialupi Codex is an important document because it supplies us, in one book, with an illustrated history of Italian songs before Franco-Flemish Adriaan Willaert (c. 1490 – 7 December 1562) travelled to Venice to found the Venetian School (1550 to around 1610). The enlumineur is unknown. When the Bizantine Empire was replaced by the Ottoman Empire, in 1453, scholars first travelled to Italy carrying books and a fully-fledged culture, mainly Greek. 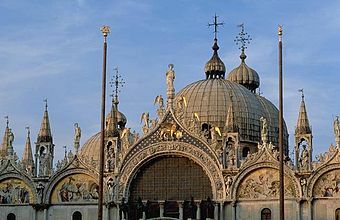 Western Europe’s Renaissance had begun and San Marco’s dome would be of Byzantine inspiration. It may be useful to use the works of Francesco Landini (c. 1325 or 1335 – September 2, 1397), as the turning-point between the early Renaissance music and the Venetian School, except that Landini’s style is abundantly ornamented as would be the case with later madrigals. 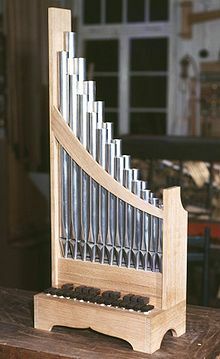 Francesco Landini was blind from childhood and worked as organist in at least two Florentine churches. He played several instruments, and built one, the ‘syrena syrenarum.’ He is protrayed above holding his portative organ or organetto. We also owe Landini a cadence (end of a piece of music), the eponymic Landini cadence in which the sixth degree of the scale, the ‘la’ (the sub-mediant) is inserted between the leading-note (note sensible [sensitive] in French), the ‘si’, and the tonic (the ‘do’) = si-la-do. Landini wrote twelve madrigals and may have written sacred music, but the compostions we know are secular. Most are ballate in two or three voices and are included in the Squarcialupi Codex. It would appear, however, that they are early madrigals. So let us keep away from possible Procrustean Beds. Landini may be an example of this or that, but Landini is also Landini, a brave man who not only coped with blindness, but used hearing to everyone’s benefit. 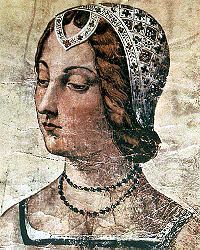 No wonder he was a close friend of the great Petrarch (July 20, 1304 – July 19, 1374), whose sonnets are an homage to Laura de Noves (1310–1348), the wife of Hugues de Sade. Petrarch caught a gimpse of her and started to write about her. “Francesco Landini.” Encyclopædia Britannica. Encyclopædia Britannica Online. Encyclopædia Britannica, 2011. Web. 24 Nov. 2011. <http://www.britannica.com/EBchecked/topic/329369/Francesco-Landini>.